Small 14k gold puffed heart charm from our Heart Jewelry collection. Heart measures approx. approx. 1/4" in size. Whether it stands alone or shines with a collection of other charms, this 14K gold small puffed heart charm communicates a message of affection in sweet, sophisticated fashion. This +"-high three-dimensional heart has been polished to a high shine, giving the yellow gold from which it's crafted an irresistible warm glow. 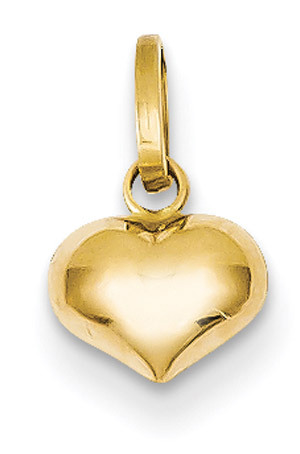 This little gold heart charm would make a lovely addition to the charm bracelet of any special lady, whether young or old, and could serve as a fitting add-on when you're giving a charm bracelet. We guarantee our 14K Gold Small Puffed Heart Charm to be high quality, authentic jewelry, as described above.